Several organizations have highlighted the importance of preparing teachers to teach students mathematics using appropriate technology (e.g., Association of Mathematics Teacher Educators, 2006; International Society for Technology in Education, 2008). This article provides examples from teacher education materials that were developed using an approach that integrally develops teachers' understandings of content, technology, and pedagogy to prepare them to teach data analysis and probablity topics using specific technology tools. Lee, H. & Hollebrands, K. (2008). Preparing to Teach Mathematics with Technology: An Integrated Approach to Developing Technological Pedagogical Content Knowledge. 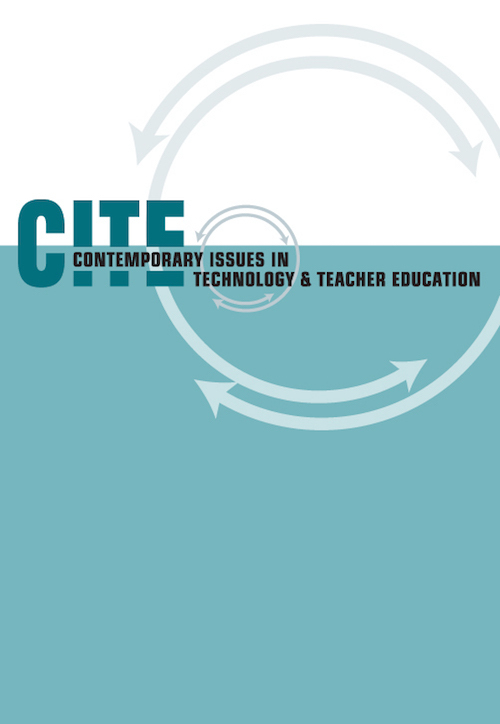 Contemporary Issues in Technology and Teacher Education, 8 (4), 326-341. Waynesville, NC USA: Society for Information Technology & Teacher Education. Retrieved April 19, 2019 from https://www.learntechlib.org/primary/p/28191/. AACTE Committee on Innovation and Technology. (2008). Handbook of technological pedagogical content knowledge (TPCK) for educators. New York: Routledge. Hollebrands, K.F., Wilson, P.H., & Lee, H.S. (2008). Understanding prospective mathematics teachers' processes for making sense of students' work with technology. Manuscript submitted for publication. Kersaint, G., Horton, B., Stohl, H., & Garofalo, J. (2003). Technology beliefs and practices of mathematics education faculty. Journal of Technology and Teacher Education, 11(4), 567-595. Koehler, M.J., & Mishra, P. (2005). What happens when teachers design educational technology? The development of technological pedagogical content knowledge. Journal of Educational Computing Research, 32(2), 131-152. Konold, C., & Miller, C. (2004). TinkerPlots™ Dynamic Data Exploration (Version 1.0). Emeryville, CA: Key Curriculum Press. Lampert, M., & Ball, D.L. (1998). Teaching, mathematics, and multimedia: Investigations of real practice. New York: Teacher’s College Press. Mishra, P., & Koehler, M. (2008, March). Introducing technological pedagogical content knowledge. Paper presented at the annual meeting of the American Educational Research Association, New York. Moursund, D., & Bielefeldt, T. (1999). Will new teachers be prepared to teach in a digital age? A national survey of information technology in teacher education. Santa Monica, CA: Milken Exchange on Education Technology and the International Society for Technology in Education. National Council of Teachers of Mathematics. (2000). Principles and standards for school mathematics. Reston, VA: Author. Niess, M.L. (2005). Preparing teachers to teach science and mathematics with technology: Developing a technology pedagogical content knowledge. Teaching and Teacher Education, 21, 509-523. Shulman, L. (1986). Those who understand: Knowledge growth in teaching. Educational Researcher, 15(2), 4-14. Simon, M.A. (1995). Reconstructing mathematics pedagogy from a constructivist perspective. Journal for Research in Mathematics Education, 26(2), 114-145. Simon, M.A., & Tzur, R. (2004). Explicating the role of mathematical tasks in conceptual learning: An elaboration of the hypothetical learning trajectory. Mathematical Thinking and Learning 6(2), 91-104. Suharwoto, G. (2006). Secondary mathematics preservice teachers’ development of technology pedagogical content knowledge in subject-specific, technology-integrated teacher preparation program. Unpublished doctoral dissertation, Oregon State University. Towers, J. (1998). Close encounters of the complex kind: Using videotapes in teacher education. Paper presented at the annual meeting of the American Educational Research Association, San Diego, CA. (ERIC Document Reproduction Service No. ED 420 625). Author Note The Preparing to Teach Mathematics With Technology project is supported by the National Science Foundation under Grant No. DUE 04-42319 awarded to North Carolina State University. Any opinions, findings, and conclusions or recommendations expressed herein are those of the authors and do not necessarily reflect the views of the National Science Foundation. More information about the project and materials can be found at http://www.ncsu.edu/project/ptmt.